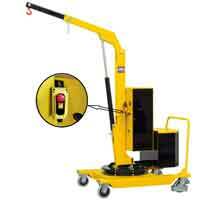 This is a heavy duty motor drive power boom counterbalanced crane that allows the lifting of loads up to 1000 kg. It is equipped with two fixed-wheel and motor wheel on the driver’s side. Easy to handle and move. 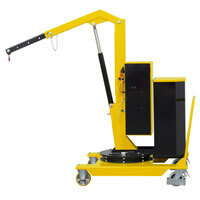 Ideal for placements over any obstruction/barrier, on 3 D machines, lathes, narrow openings, assembly lines, etc. Ideal to place moulds, spare parts and various products on machine tools with perimeter protections or narrow openings (presses, lathes, milling machines). It comes with a built-in ballast weight and two traction batteries. 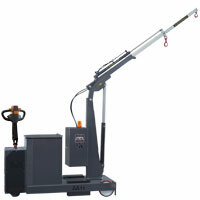 OMNIA is a heavy-duty power drive power boom counterbalanced crane that permits the lifting of loads up to 1500 kg. 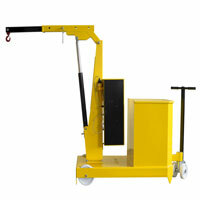 It is equipped with two fixed-wheels and motor wheel on driver’s side, for an easy handling. Ideal to carry out precision placements over obstruction/barrier, onto 3D machines, machining centres, lathes, assembly lines, etc. 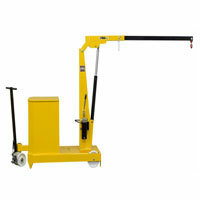 The 01M5 500kg manual lifting counterbalance crane is an extremely versatile and easy to operate crane. Suitable for lifting loads of various shapes and dimensions from the ground to machines, assembly lines and anywhere needed. 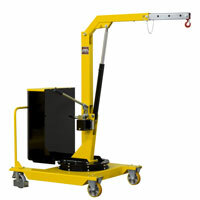 The 01B2 200kg electric lifting counterbalance crane is a heavy-duty counterbalanced workshop crane (built-in ballast weights) with a 360° pivoting arm, suitable for handling industrial equipment up to 200 kg in line with Safety international standards. 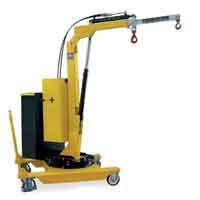 The 01B5 200kg electric lifting counterbalance crane is a counterbalanced workshop crane (built-in ballast weights) with a 360° pivoting arm, suitable for handling industrial equipment up to 500 kg in line with Safety international standards. 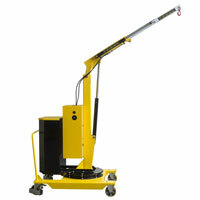 The 01B5SE 500kg electric lifting counterbalance crane is a heavy-duty, extremely versatile counterbalanced workshop crane (built-in ballast weights), with a 360° pivoting arm, suitable for lifting loads up to 500 kg. The Gz10700 fixed jib crane is a counterbalanced workshop cranes (built-in ballast weights) suitable for lifting loads up to 700 kg, with a 4-position extendible jib. The GzB 10700 fixed jib crane is a heavy-duty counterbalanced workshop cranes (built-in ballast weights) suitable for lifting loads up to 700 kg, with a 4-position extendible jib. 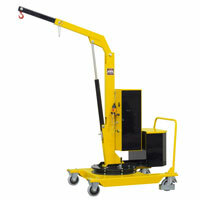 The GZ1000 is a cantilevered ball bearing crane that allows lifting loads up to 1000 kg and a free overhang up to 2000 mm. Equipped with 2 fixed wheels Ø 250mm and 2 steering wheels Ø 200mm with a brake on the steering rudder to allow extreme maneuverability even at full load. 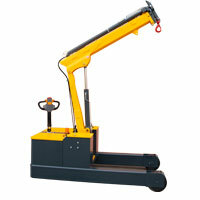 The crane allows you to pick up the material and move it directly on the machine tools or other desired positions. 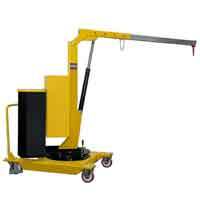 The GZ1000BP is a ballasted cantilever crane that can lift loads up to 1000 kg. It allows to take the material located on the ground, on shelves or in containers and to move it directly on the machine tools or in other desired positions. 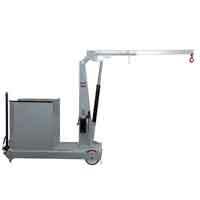 It is a ballasted cantilever crane that allows lifting loads up to 1000 kg. Equipped with 2 fixed wheels Ø 250mm and 2 steering wheels Ø 200mm with a brake on the steering rudder to allow extreme maneuverability even at full load. The crane makes it possible to pick up the material located on the ground, on shelving or in containers and to move it directly on the machine tools or in other desired positions. Very agile thanks to the 360 ° rotation and frontal encumbrance of only 995 mm, they are equipped with traction battery and battery charger. To the movement of the joystick lever in the positions of the rising arm, extension feed and descent, the microswitches automatically activate the hydraulic unit motor that allows high precision movements; the descent is due to a controlled fall and safety devices with the engine off. 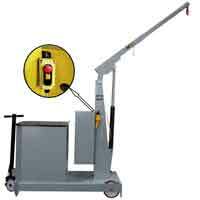 They are equipped with a hanging control panel with electric up and down commands for the boom and emergency stop and is equipped with a traction battery and battery charger. Easily manoeuvrable thanks to the 360 ° rotation and pivoting wheels with high flow and high smoothness with bumper supports and parking brakes. 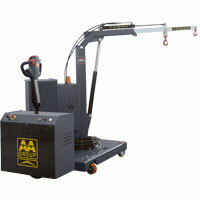 Easily manoeuvrable thanks to the 360 ° rotation and the high-flow pivoting wheels with high smoothness with buffer supports and parking brakes, the lifting arm can be extended to 4 different positions.